The Libraries recently added a new free resource to our collections: the Getty Research Portal. Users will find rare books, exhibition catalogs, auction catalogs, and other full-text literature in the public domain (mostly published before the 1920s). Page images are high-quality and able to be downloaded and saved. Contributing institutions include the important art research libraries at the Getty, the Metropolitan Museum of Art in New York, the Frick, and Columbia University, among others. 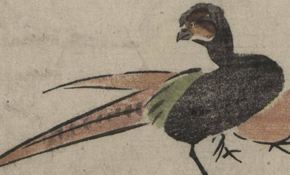 The image above is from Plate 17 of the 1797 Japanese book Abbreviated Drawing Styles for Birds and Animals by Masayoshi Kitao, held by the Metropolitan Museum of Art.